I read about Hakka Connexion from Lingzie’s blog. Since I am trying to infuse some Chinese traditions and roots into my kids, I tried to get them to differentiate my Hainanese Chicken Rice from their Hakka noodle. *roll eyes* Hainanese Chicken rice wins as usual. They are not keen about Hakka foods eventhough I keep reminding them they are Hakkas. 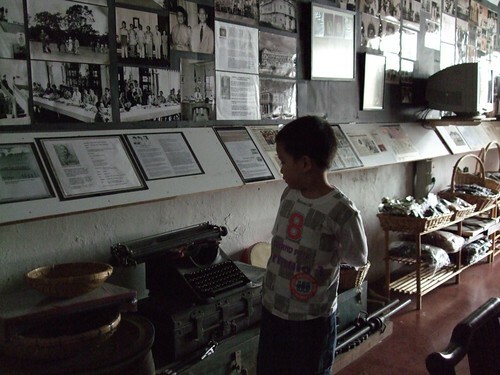 So, only my poor little boy get dragged along in our ‘get to know Hakka’ quest as the rest were not keen to join us. I love quaint and antique places like Hakka Connexion! It spells good childhood memories to me. I used to live next door to a Hakka family when I was small. They were rubber tappers and I remembered spending some of my childhood days in their home. While the parents and older children went up the hill to tap rubber, the younger ones will stay behind at home. The parents normally prepared huge dishes of steamed pork with mui choy, salted fishes and some other simple dishes for their lunches. Hakkas probably were generally from the poorer region as they eat mostly pork and vegetables, unlike the richer Cantonese folks or the meat loving Hainanese and their Western influenced dishes. The lui cha fun or thunder tea rice at RM6. 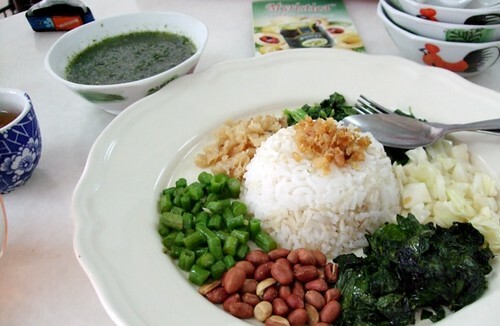 It is really a simple plate of white rice with all sorts of vegetables and peanuts. The brownish ones are the dried prawns and mui choy. Meanwhile, I really cannot tell what the green leaves are. 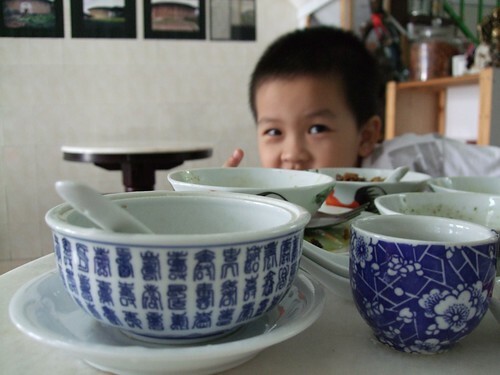 The rice is served with a bowl of the green herbal soup. Finally I get a taste of lui cha which I have read so much. It is not exactly the tastiest food but it has a unique taste and very pleasant on the stomach. I can just imagine how hard lives must be for the Hakka back then…..No abalone, fish maw, dried oysters, sea cucumbers…. 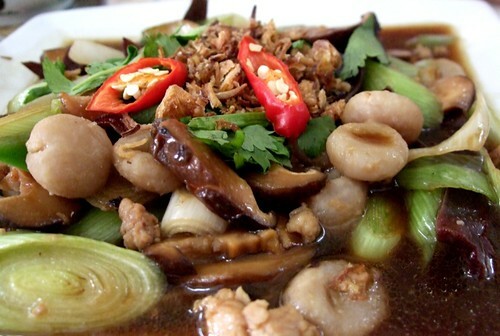 This is the version of Hakka abacus dish I had from Hakka Connexion. I have made my own Hakka Abacus and I think it is much nicer than this plate which costs RM10. You can find my Hakka Abacus recipe from my other food blog. The one from Hakka Connexion has way too much leeks and poor me had to finish all of them because hubby hates leek. There aren’t enough Hakka abacus or the yam coins in there. 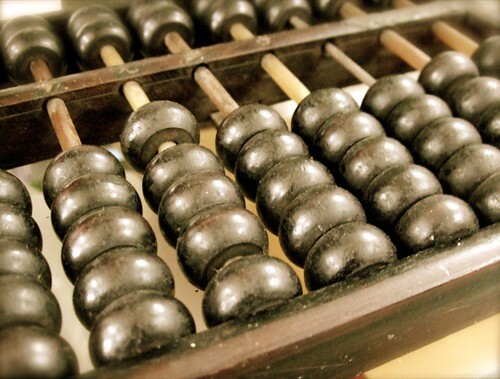 This is what the real Chinese abacus looks like. The next time I make the Hakka abacus suan pan zi, I am going to make the yam and tapioca flour ball smaller. My camera ran out of battery so I didn’t manage to take pictures of the tu ka chor or vinegared pig trotter and the Hakka fried chicken (which is tumeric flavoured). I also missed taking more photos of the adjoining building which housed Tan Sri Wong Pow Nee’s photos, documents and other antiques. 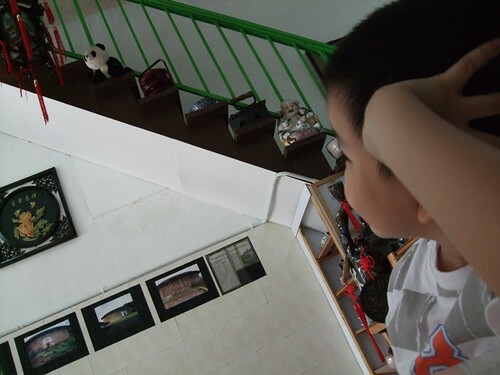 My little boy saw CM Lim Guan Eng’s photo on the wall and he loudly proclaimed, “Mommy…that man I took photo with is on the wall!” Hahahha. So, I told him that is the Chief Minister of Penang and this uncle, referring to Tan Sri Wong is the first Chief Minister of Penang while CM Lim is the fourth already. My boy also saw the photos of Tan Sri Wong Pow Nee’s funeral and some of the very old photos of priests with Tan Sri. He immediately noticed the cross and told me, “The old old uncle also Christian like us, right? You see…the big big cross there?” Sigh…he noticed every single thing. We had fun going through all the old photos and also some photos of the Hakka village in China. The Hakka Connexion is also linked to another restaurant serving porridge. In all, there are three buildings that are connected. If you want a little bit of history with some traditional Hakka dishes or porridge meals, check out Hakka Connexion. There is an article from The Star on Tan Sri Wong’s son who is the owner of the place. Hakka Connexion is at Jalan Bawasah. Jalan Bawasah is the road at the back of FIMA or Giant. You can access Jalan Bawasah from Jalan Larut. At the end of the meal, this Hainanese woman asked her Hakka husband, “An yong, how sit moh?” (how? good to eat or not?) And the Hakka man said, “Ngai mm hiu sit.” (I don’t know how to eat aka how to appreciate the taste). My 2 bro in laws are Hakka. Every meal must consist of pork. If not, cannot makan. They have those canned pork on ‘standby’ in the kitchen just in case my sisters did not cook a pork dish that day. I’m half Hakka but I don’t speak Hakka. LOL! Looks good leh… esp the first dish. Love how they arrange the vege and nuts. So neat and simple. So far I tried lui cha only once. That time I was really hungry and there were nothing nice to eat, so I was forced to try. Frankly speaking, it is quite nice, very healthy food. The stall owner was very proud to introduce it to me and did some explanation on how and when he started the business.